Designed especially for first time female shooters, this class acquaints you with the handgun in a laid back, humorous, hands on atmosphere. Learn the basics of safety, handling and shooting a handgun in a group atmosphere where you will feel right at home with the other novice shooters. We guarantee you will enjoy this class so much you will leave with a smile on your face. 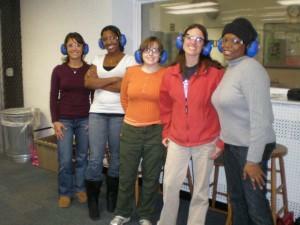 Sign yourself or your female friends up for this three-hour class of fun and education about handguns. Personalized Firearms Instruction for WomenOur "Ladies Only" class, limited to 12 ladies at a time, covers handgun safety (both Semi-auto and Revolver), safe handling, safe unloading, shooting fundamentals and practice shooting .22 caliber handguns on the Pistol Range.